Editor’s note: Anand Iyer was the chief product officer at Threadflip. Previously, he was co-founder and CTO of Hitpost, acquired by Yahoo, and managed product at IGN Entertainment and Microsoft. The reality is that there are different expectations of working parents in the workplace. The more we can examine these assumptions and expectations, the more we can address them. And us, working parents, need to proactively and preemptively address them in order to establish a work life balance. Conventional wisdom is that dads aren’t naturally good with children or don’t want to spend time with them. But according to a study of 1,000 fathers on “Fathering in the Workplace,” fathers spent 2.65 hours with their kids on a typical work day (I’d estimated that I was spending approximately two hours with my daughter on a typical workday). 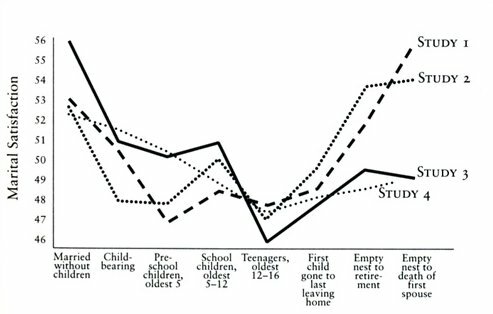 The net-net of this study was interesting: Fathers were actually happier when they spent more time with their kids. Money can’t buy us time. We need to create the balance and understand what it is that we’re living and working so hard for. Brian Grey, ex-CEO of Bleacher Report, told me that he established the balance early between work and life. Brian would get up and work early, or spend early weekend mornings working when the kids were still asleep. And it’s no surprise that studies show that spending more quality time with your child actually leads to better development for the child – this OECD research shows that children with highly involved fathers perform better on cognitive tests, for example. I see a win-win-win here: when spending more time with their children, fathers are happier, which invariably leads these fathers to being more productive at work, which means employers are happy, and children benefit from more parental time. By the way, Sheryl Sandberg, COO of Facebook, and arguably one of the busiest people in the world, makes it a point to leave work at 5:30. The U.S. is 1 of 4 countries in the world that does not require parental leave. It ranks last in government-supported time off for new parents. I was back at work virtually the same day we brought Ava home from the hospital. And my wife took three months off before heading back to work. Paid family leave is a positive thing for parents, and seems to have a solid upside for employers. According to one study, mothers in California who took maternity leave were 6 percent more likely to be working a year later than those who did not. Not just that, those mothers who took leave were more likely to work more two years after the birth of their child than those who did not take leave. I know the Obama administration is working on some super interesting things, by offering federal employees the right to take paid time off when they have children. What Facebook is doing by offering four months of paid family leave (including a “baby stipend”) is commendable. And I know most tech companies do a better job of offering this “perk” than non-tech companies. But let’s use the perk – let’s pause and enjoy the time we get with our loved ones..
My neighbors and my relatives go out of their way to give me extra kudos when they see me spend time with my daughter, and I don’t understand why. And by the same token, neither my wife nor I get why my wife is victimized if she’s babysitting by herself one evening. We’re just doing our jobs as parents. Since I’d recently left my job to spend more time with the little one, on some mornings I’d take her to parks and get odd looks from moms and nannies – invariably I was always the only adult male there. 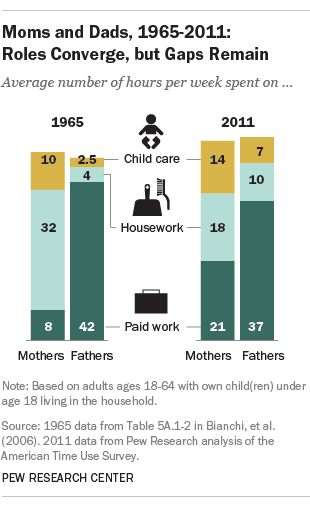 The good news, though, according to Pew, is that the roles of mothers and fathers are converging (somewhat – we still a long ways to go). If you were to survey a parent who lives in SF, there is an extremely high likelihood that the parent has heard of Golden Gate Mother’s Group. GGMG happens to be the most prolific group in what some would consider the most liberal city in the world yet, gay fathers, for example, are unable to join the group and reap the benefits of being a part of this thriving community. Really? As a first-time parent, I’ve done my share of assuming that there are some duties my wife would assume, and vice-versa – but it is unfair and unrealistic to make and assert such assumptions about gender based roles anymore. When I was still working full-time, my wife who also has a full-time job would invariably be the one to get home to relieve our nanny at 5.30 p.m.
And in hindsight, I feel terrible about leaving that responsibility entirely up to her. Her job is just as important (well more important now) and there were evenings when she couldn’t leave work to make it back home on time. Now that I don’t have a full-time job and I’ve seen my wife juggle many work responsibilities with our new family life, I’ve realized how difficult that is and I’ve come to realize how I want to be a world-class father and company founder once I do have a full-time job again. Our marital satisfaction is not going to peak again till our first child goes to college? Sorry, I am unwilling to concede that I’m going to let our happiness decline for another 16 years. There are things we can start doing, patterns we can establish in our lives today to sustain over level of happiness. So, would you consider talking to your family for 20 minutes every week to figure out how you can all be happier? Perhaps you can figure out where the balance is off and how it could be rectified. The ultimate goal here would be to identify what you need to do to stay happy. What I keep reminding myself is that I’m pretty damned lucky and that I need to pause to enjoy the journey – I’m an immigrant who in the 90s dreamt of living in the valley some day and working on cool cutting edge stuff, while being married to the woman of my dreams and raising a family here. Fortunately for me, I’m living my dream. What I’m hoping to achieve with a healthy work life balance is actually way more than what I could have ever dreamed of having… I’m lucky to have gained so much already. I don’t have all the answers – as I was talking to Aunkur Arya, GM at Braintree and a fellow new parent, what we realized is that we need to get this conversation started – I’m hoping we start a practice that working parents can employ to establish better balance in their lives before it gets too late for them. And that working parents can be given the same level of respect at a workplace as non-parents. Meanwhile, I salute the folks who are (somehow) making it all work. Huge thanks to @tomiogeron, Exitround, for helping me with this post. Image updated to better reflect article content.